The Nintendo Switch Playstand from HORI allows you to use your console handsfree. 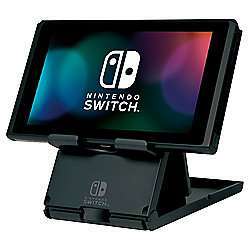 This officially licensed multi-angled stand is ideal for use with the controller pad, or can allow you to continue playing while your Switch is charging. It's a good little stand, I find if you put it on a coaster it's easy to move around for the best angle when playing in table top mode and gives a little extra height if you want it. There's three slats so you can adjust how high you want the screen too though I tend to stick to the highest personally. I have this wee stand and it's great for travelling. It has three different angles and a gap that frees up the charging port. It also has two little pins that fit in the bottom of the Switch to keep it in place on the stand. A good purchase. When was it not this price... I got mine when the switch came out for 9.99. I got a generic one from ebay for £2.68 exactly the same function. Had to wait 4 weeks mind. Bought this in Argos about 3 months ago for this price. Cold. I really don’t see the deal in this considering it’s been out since Switch release with this price as rrp! Voted cold it's RRP and can get a copy without the branding for a fiver off eBay. Don't buy this tat, it's awful. Makes the original dock look like a luxurious solution.